Mansar Houghton married Sara Jane McMarlin in Jul 6, 1834 at VT, USA, Mansar, 21, Sara, 16. Cynthia Welton married Daniel Houghton, son of Daniel Houghton and Susannah Pierce, in Dec 25, 1816 at Bradford, Orange Co., VT, USA. 1860 Census 1860 Fairlee, Orange Co., VT, USA, age 34, a farmer, property $3700; and John Austin, 13/73? Daniel Houghton Jr. married Laura Caroline Lovell, daughter of Elijah Lovell Jr and Caroline Houghton, in Mar 30, 1851 at Bradford, Orange Co., VT, USA. Daniel Houghton Jr. married Minerva Sarah Angell in Sep 29, 1859 at Montpelier, Washington Co., VT, USA. Lucy (?) married William Price Houghton, son of Daniel Houghton and Susannah Pierce. Eunice (?) married William Price Houghton, son of Daniel Houghton and Susannah Pierce. Death Mar 15, 1855 Vestal, Broome, NY, USA, Headstone says he was killed by a flyweel of a steam engine at a log mill. Aurilla Houghton married (?) Wilson. Johanna (?) married Alexander Houghton, son of Otis Houghton and Lucinda Fessenden. 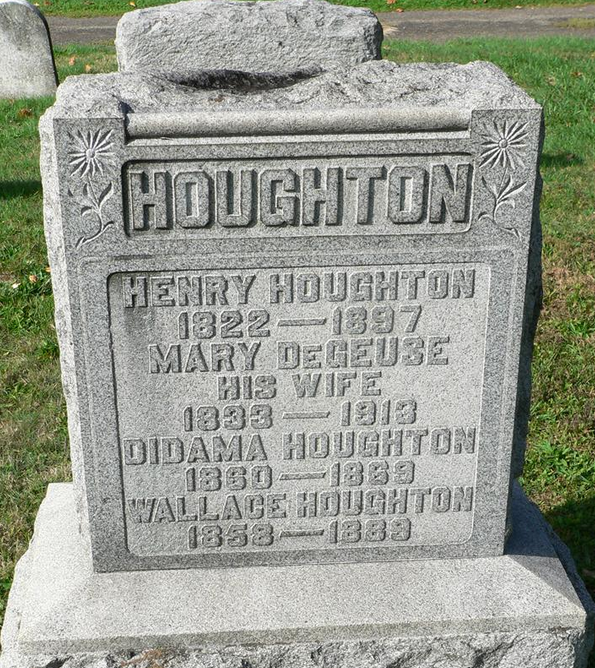 Mary DeGuese married Henry Houghton, son of Otis Houghton and Lucinda Fessenden, in Sep 13, 1851 at Owega, Tioga, NY, USA, at the Owego Central House. Cordelia Houghton married (?) Garison in circa 1874 mar 36 y in 1910 census. Laverna Mary Houghton married Joshua C. Underwood. Joshua C. Underwood married Laverna Mary Houghton, daughter of Henry Houghton and Mary DeGuese. Gertha Houghton married Perceival S. Mercile in circa 1890. Clara Ethel Houghton married Adelbert Coffin in Aug 20, 1882. Adelbert Coffin married Clara Ethel Houghton, daughter of Silas Roland Houghton and Samira Collins, in Aug 20, 1882.